Roberto Benigni, whose "Life is Beautiful" won three Oscars, has now put his puckish, high-energy stamp on a figure dear to Italians - Pinocchio - causing many here to wonder how he'll make their beloved puppet come to life. On Friday, Benigni gave the Italian media their first look at "Pinocchio." While boldness has been his trademark - the Holocaust story "Life is Beautiful" employed whimsy and comic touches – Benigni apparently decided to play it safe with "Pinocchio," according to those who saw the preview Friday. "This Pinocchio doesn't seem to have any intention to astound but only to tell a story that everyone knows in the simplest and most entertaining ways possible," the Italian news agency ANSA said. The film, which opens in Italy next week and in the United States at Christmas, is the costliest Italian production ever, at more than $40 million. It was shot in virtual secrecy at the former chemical-plant-turned-studio that Benigni used when making "Life is Beautiful." For Italians, Carlo Collodi's 1880 book, "The Adventures of Pinocchio," is more than just a classic tale for children. For generations, the story of how a naughty, headstrong puppet transforms itself into a responsible little boy has been a rite of passage, a kind of morality primer on how to grow up. "It sounds terrible to say it's like the Gospel or the Bible," said Sister Lorenzina, a nun whose second-grade class last year put on a stage version of Collodi's work. "But it has those values, and the children read it." As he did in "Life is Beautiful," Benigni doubles as star and director in "Pinocchio," and his wife Nicoletta Braschi returns here as his foil, as the blue-haired fairy. 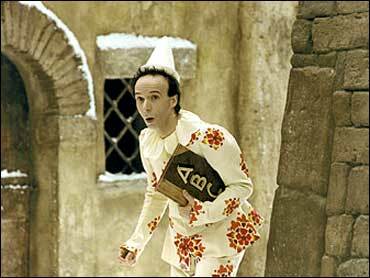 With his irrepressible impishness, Benigni was expected to give a highly physical interpretation likely to make the audience forget they are watching an adult perform, and not a boy. "I feel so much like Pinocchio that when I see a tree, I yell out, 'Daddy,"' the actor said on state TV Friday. The 49-year-old Benigni told a news conference Friday that he and Federico Fellini, the Italian film maestro of fantasy who died in 1993, had discussed doing Pinocchio together. "On his deathbed, he told me: 'You will do Pinocchio,"' Benigni said. Before photographers, Benigni pranced about, pretending to make his nose grow. In "Pinocchio," special effects do the trick. "A puppet outside of the rules, clever, lying and highly reckless. But in the end, he squeaks by." Marketers have prepared toys and T-shirts for the Christmas shopping season using Benigni's version of Pinocchio, and also a slew of books, including at least one psychoanalytical interpretation of the children's tale. Some are skeptical about the spinoffs. Gianfranco Falchi, whose family-run toy store in Rome carries classic-looking Pinocchio toys, said he didn't order any of the Benigni-style toys. "They don't respond to the image children have of Pinocchio," he said. "They have Benigni's face, not the classic one." While many Americans' image of Pinocchio and his story might come from Walt Disney's 1940 animated classic, Italians tend to have a different image, based on the books they had as children. Many have precise images of how Pinocchio should dress, such as just what kind of a print shirt he should wear.